Visiting Key West is like visiting many of the different places in Florida, as the state is made up of beautiful beaches and sunshine that makes this a one of a kind tourist destination. In fact the state is called the sunshine state for a reason, making the beaches an ample reason to visit Key West. If you have been planning a trip to the beautiful region there is one tour that is a definite must see and that is the Key West Shore Excursion: Watersports Partyboat. 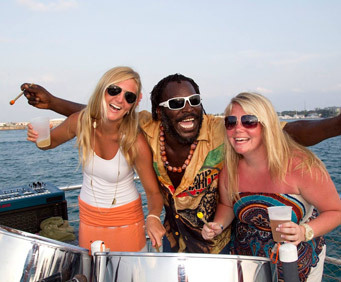 What is better the enjoying the beach life on a party boat? This all day tour will take you out onto the water like never before, as you enjoy a fully furnished party boat and see the shore like never before. This one of a kind tour is a much more cost effective option then purchasing an actual boat, and you'll get to enjoy the entire day like never before with your family. This is a one of a kind excursion that is unlike anything else you will experience, making for a one of a kind trip that you'll fully enjoy. Every aspect of the Key West Shore Excursion: Watersports Partyboat is a fun time, and the party boat is not only safe but also one of the more fun ways to see the beach. Whether you want to entertain your family or a bunch of friends from work this is a surefire way to throw a party that they will never forget. Next time you are thinking about visiting Key West Florida check out the one of a kind Key West Shore Excursion, this is a stellar way to spend the day. 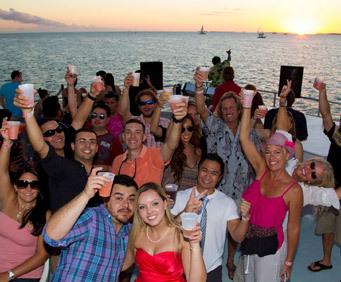 Maximize your Key West shore excursion time on a watersport party boat! While your cruise ship is docked at the Key West port, head out into the beautiful sea on a catamaran, and cruise to a sunken ship wreck in shallow water. You'll get several activities for one price - jet skiing, snorkeling, banana boat rides, kayaking, sunfish sailboat, windsurfing, waterskiing, knee-boarding or just floating on a raft. While you're off your cruise ship in Key West, make the most of your time on a party boat shore excursion, where you'll get out on the water to have some fun. The excursion includes free burgers and hotdogs on the grill, soft drinks, a veggie tray, chips and draft beer (beer available on the return journey only). Choose from several activities like windsurfing, knee-boarding, sailing on a sunfish or just relaxing on a raft. This shore excursion is a fantastic way to live up the warm, clear water of Key West and have some fun while you're in port. For more adventure, add parasailing for USD$21.50 (payable direct). 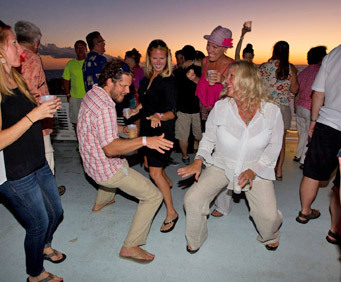 We will ensure your excursion ends with ample time for you to return to Key West for your ship's departure. In the rare event your ship has departed, we will arrange for transportation to the next port-of-call. See our terms and conditions for full details.